15 InnovativeHealthMag.com Lee. Fortunately for the firm, at that time in its history it was comprised of the right partners who were working together at the right time — lawyers like Richard J. Brake, Barry D. Boughton, Kenneth G. McIntyre, Donald L. Reisig (former State Bar of Michigan President), Timothy J. Donovan, Stephen R. Zynda and George Sinas. Those partners worked together to keep the firm on track and to keep it true to the vision that Tom and Lee shared when they founded the law firm. Nevertheless, those days were difficult. Thinking back on that sad time of transition, George Sinas remembers the invaluable contributions of his recently retired partner, Tim Donovan. When Tim retired in June 2016, George remarked, “I’m not sure the Sinas Dramis Law Firm would have survived to become what it is today had it not been for the fact that Tim Donovan was there to help us get through those difficult years and keep this firm true to its mission and purpose. Tim and I were, to borrow the analogy, ‘soldiers who shared the same In 1975, George Sinas, son of Tom Sinas, graduated from law school and joined the Sinas Dramis Law Firm. George’s dream had always been to work with Lee Dramis who, by then, was known as the “King of Torts” in the Central Michigan area. Sadly, however, George’s opportunity to learn from his hero and mentor was short-lived. In 1981, Lee Dramis died at the young age of 58 years as a result of brain cancer. During Lee’s terminal illness, there was one person who was always at his side to support and help him — his friend and partner, Tom Sinas. Lee’s death was devastating to all who worked with him — especially George and his father, Tom Sinas. Even though Lee’s passing was indeed difficult for all, Tom did not lose his perspective and good nature. The day after Lee died, Lee’s widow asked Tom to help her pick out a cemetery plot. Tom took her to the same cemetery where the Sinas family had purchased plots and was able to purchase a plot that was virtually next to those of the Sinas family. Tom returned to the office that same day and, with his characteristic big smile, proclaimed to everyone, “I have some good news: I made sure Lee and I will always be next to each other, so when I go, we can start another law firm.” Unfortunately, however, the event to which Tom had humorously alluded came to pass much sooner than anyone anticipated. In April 1985, less than three and one-half years after Lee died, Tom Sinas suddenly passed away as a result of cardiac arrest at the age of 63 — a medical event that was clearly related to his lifetime cardiac disability. The loss of Tom Sinas and Lee Dramis within such a short time was a terrible experience for all the lawyers and employees of the Sinas Dramis Law Firm. Moreover, it caused many in the legal community to predict that the Sinas Dramis Law Firm would never be able to survive the death of its two legendary leaders. However, those pundits of pessimism were soon proved very wrong. The law firm actually grew closer together than ever before in the wake of losing Tom and foxhole’ during those most trying times.” Over the next three decades following the death of his father, George Sinas dedicated himself to preserving the law firm’s tradition of excellence which had begun so many years ago. 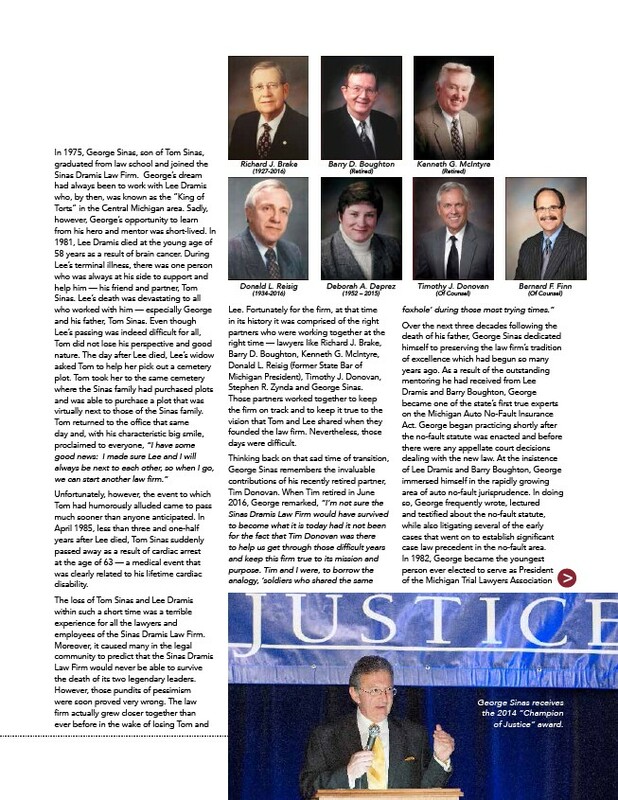 As a result of the outstanding mentoring he had received from Lee Dramis and Barry Boughton, George became one of the state’s first true experts on the Michigan Auto No-Fault Insurance Act. George began practicing shortly after the no-fault statute was enacted and before there were any appellate court decisions dealing with the new law. At the insistence of Lee Dramis and Barry Boughton, George immersed himself in the rapidly growing area of auto no-fault jurisprudence. In doing so, George frequently wrote, lectured and testified about the no-fault statute, while also litigating several of the early cases that went on to establish significant case law precedent in the no-fault area. In 1982, George became the youngest person ever elected to serve as President of the Michigan Trial Lawyers Association Richard J. Brake (1927-2016) Barry D. Boughton (Retired) Kenneth G. McIntyre (Retired) Donald L. Reisig (1934-2016) Deborah A. Deprez (1952 – 2015) Timothy J. Donovan (Of Counsel) Bernard F. Finn (Of Counsel) George Sinas receives the 2014 “Champion of Justice” award.